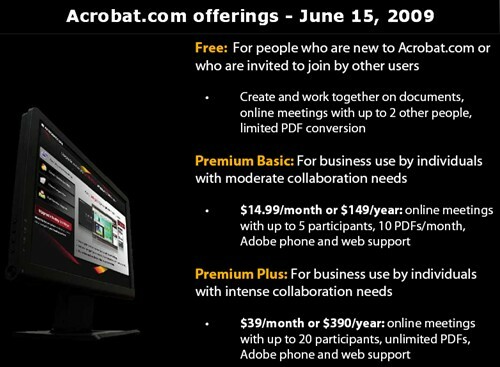 Adobe today made forays into the online “collaboration market”, unveiling new subscription-based Acrobat.com services targeted at work groups. 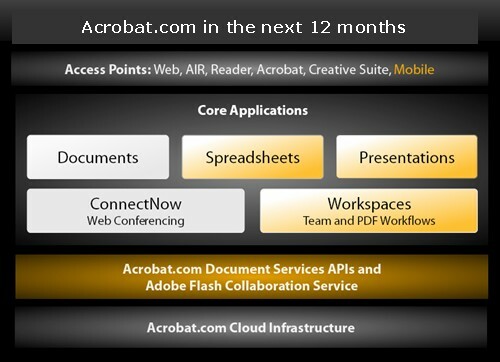 Acrobat.com is a suite of Adobe applications that allows users to create, store and share documents and PDF files — as well hold conferences and collaborate — online. Today, as the beta period ends, Adobe has announced a subscription-based Acrobat.com service, which includes an upgraded and expanded version of its popular ConnectNow online conferencing application. ConnectNow allows participants to collaborate with text and audio chat, video conferencing, whiteboard, screen-sharing and collaborative remote control of any of the participants’ computers, with their permission. During the beta period, ConnectNow’s free service could be used for online meetings with up to three participants. “The free service will continue,” noted Rick Treitman, entrepreneur-in-residence at Adobe. “We want everybody to have an [Acrobat.com] account, create documents, presentations and spreadsheets.” Treitman is former CEO of Virtual Ubiquity, the firm Adobe acquired in December 2007 primarily for its Buzzword offering. He said for online meetings involving three people or fewer, the service will continue to be free. However, for larger work groups, Adobe is now offering a paid subscription to Acrobat.com, with expanded capabilities and enhanced support. Premium Basic – Priced at US$14.99 a month, or $149 a year, this plan supports meetings with up to five participants, and enables the creation of up to 10 PDFs a month. Premium Plus – This US$39-a-month (or $390 a year) plan supports online meetings with up to 20 participants, and allows creation of an unlimited number of PDFs. Both the Basic and Plus plans come with Adobe phone and Web support. (Users of the free service rely on e-mail and forums for customer support). Another banner announcement from Adobe today is the release of an early version of its Spreadsheets service — on Adobe Labs. Conventional “check-in, check-out type” electronic spreadsheets generally permit only asynchronous editing and collaboration, Treitman noted. While such simultaneous editing solves many problems, it can also create a few, he noted. For instance, a “sort” done by one member of the team on a shared spreadsheet could complicate things for another team member, he said. Adobe’s solution to this conundrum is including a feature called Private View. Besides Spreadsheets (that was added to Labs today), Presentations is another in-development app placed in Labs a couple of weeks ago. It will continue to be accessible to anyone with an Acrobat.com account. This free service, which was also in public beta, enables users to build Flash presentations through their browsers. Presentations created with this application can be enhanced with multimedia and transitions. It uses the Adobe’s Buzzword word processor — a Microsoft Office Word competitor — to edit text on slides. Future capabilities to be included in Presentations, includes links to Photoshop.com and to Kuler – Adobe’s online application for creating colour themes. He said upcoming releases of Presentations will also enable users to share and pull assets – such as images – from various image sites. He said both Presentations and Spreadsheets would live on Labs for a while as they aren’t yet complete. Meanwhile, paid subscribers and users of the free service would be able to access other core Acrobat.com applications including Buzzword. This online word processor allows users to create and collaborate on text documents. The Buzzword “sharing bar” feature is one that users find particularly useful, Treitman noted, as it tells them who has rights to the document, and if someone is currently active in it. The Sharing bar is included across all the other key Acrobat.com applications, including ConnectNow and Presentations, Treitman said. He said the History bar enables users to compare multiple versions of the document, and see what’s been added, or deleted over time. The ability to insert inline comments is one of the most compelling features of Buzzword, the Adobe executive said. Treitman said the user just needs to mouse over and click a little comment bubble on the right margin and it opens up. Organizer – a tool that allows users to put documents created in separate Acrobat.com applications into collections … much like play lists. This will be available in the fall. Workspaces – slated for a winter release – will be a collection of admin and management tools that participants in a workgroup would need to collaborate and keep track of documents and meetings. Today’s announcements are the latest in a series of Adobe product and service offerings targeting the “collaboration” space. The social dimension of software development was a key theme emphasized by Adobe’s chief technology officer (CTO) Kevin Lynch in his keynote at the Adobe Max Conference in San Francisco, in November 2008. “The reality today,” Lynch said, “is that software is no longer a solo experience. It involves your friends, and humanity around you.” He said Adobe’s goal is integrate this social dimension in all the software developed by itself and its partners. At the Conference, Lynch demoed a technology called CoComo that enables developers to build collaborative features into their Web application.